If you’re an angler, whether you ascribe to fly or reel, Jackson Hole fly fishing should be on the top of your list. 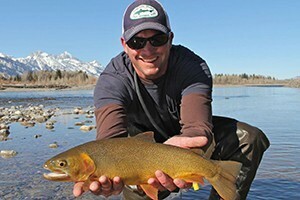 Find guides, shops, and local information here to help plan your Jackson Hole fishing trip. 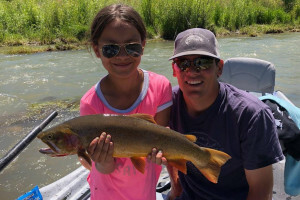 When it comes to fishing Jackson Hole regional waters, we are the experts! 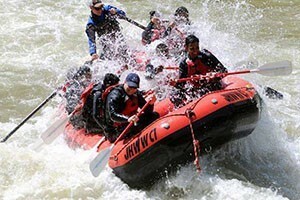 Full & 1/2 day trips on the Snake, Green, New Fork and Salt Rivers. Come fish the secluded waters of the Green River & the New Fork River with our skilled local guides at a price that can’t be beat! Full-day float trips just $499. Expert guide service offering float & wade fishing trips on all local waters. Exclusive access to remote backcountry creeks! Fishing gear included, lunch prepared streamside. 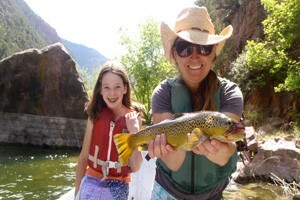 Offering 1/2 & full day Fly & Spin Fishing Trips for all ages. 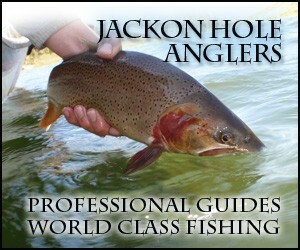 Fishing Jackson Hole, and the Green, New Fork & Salt Rivers for over 30 years! Equipment & lunch included. Any guide will tell you the biggest Snake River Cutthroats are in the Park. We prove it everyday since we've lived inside the Park for 85 years. We know where they are. Explore private blue ribbon rivers & spring creeks without any crowds! Stay in one of our luxury self-catered cabins & catch trophy trout right out your door! Join these angling professionals for a half, full, or multi-day trip on the most scenic rivers in the Teton Range. Fly fishing and Spin fishing. Explore the best fly fishing in the Jackson Hole & Pinedale Wyoming area! Our team of professional guides will show you the best public & private waters to fish in Western WY! 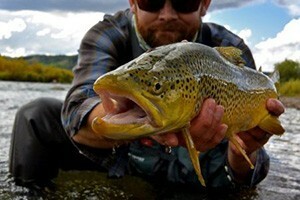 Jackson Hole's leading fly shop and guide service offering 1/2 & full day float trips, wading trips, & casting lessons. Located on the Town Square in the heart of Jackson. 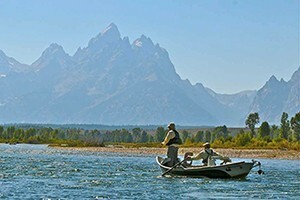 The only fly shop in Teton Village offers guided fishing trips in Jackson Hole and Grand Teton National Park. Fly casting lessons, experienced guides & scenic floats, too. 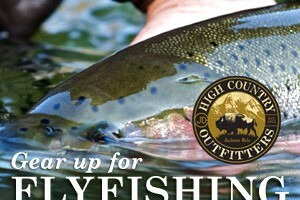 Spring High Water Special - 1/2 day guided fishing from Jackson Lake Dam to Pacific Creek, $425. Clearest water on the Snake River! Book now thru May 31st. Orvis Endorsed, family owned fishing outfitter. 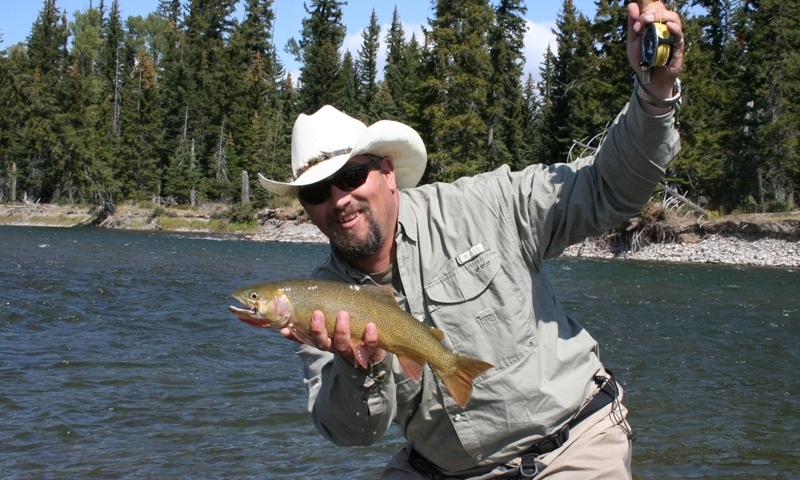 Fishing pack trips into the Teton Wilderness on the Yellowstone & Throrofare Rivers. Experienced guides, world class fishing! 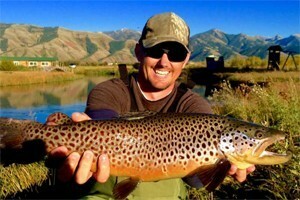 Experience the best fishing Jackson Hole has to offer! We offer full and half day guided trips for every angler. 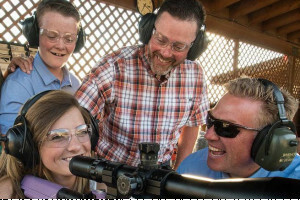 Expert, friendly, and professional guides. Book today! Fish the famous Snake River. 1/2 day & full day trip options. Transportation, snacks, drinks & lunch included. Gear & flies provided! Experienced & 1st time anglers welcome! Overnight horseback pack trips ranging from 1 night 2 days to longer trips in the Bridger-Teton National Forest. Awesome scenery and great fishing on each overnight trip! Celebrating 30 years as Jackson Hole & Yellowstone's premier outfitter with Owner/Guide Greg Falk. Private Scenic Floats & Guided Snake River Fishing Trips. Some of Wyoming's best fishing is in the backcountry, just miles from downtown Jackson. We offer 2 & 3-day fully outfitted trips, or full-day ride-in-and-out to fish Trips. Courteous, professional fly fishing guides. 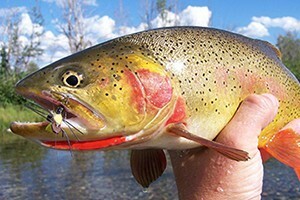 Float and wade fishing trips in Yellowstone Park & Madison River. All ages welcome. Beginner to expert. All equipment provided. Wilderness horse pack trips to some of the finest blue ribbon trout streams in the Rocky Mountains! Daily or multi-day overnight trips. Dunoir Fishing Adventures, LLC proudly serves Dubois, Lander, Jackson, and Thermopolis, Wyoming to fulfill your fly fishing needs year-round. 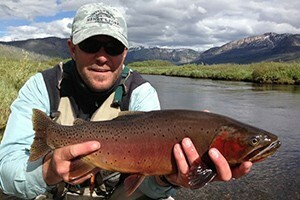 Join our guides with over 70+ years experience fishing in the Jackson Hole/Alpine Wyoming Area. Equipped with drift boats, top of the line rods and reels and river knowledge. 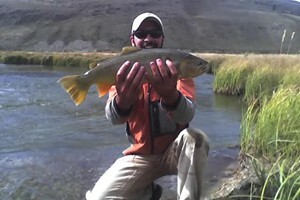 Independently guided fly fishing trips in western Wyoming. 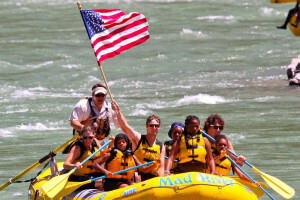 Destinations include Yellowstone National Park, Dubois and Jackson Hole rivers and streams. Float and wade trips! 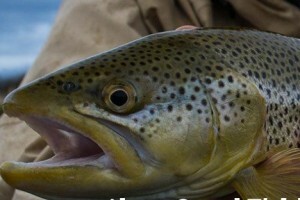 Guided fly fishing trips offering some of the finest fishing for Rainbow and Brown Trout in the state of Wyoming! 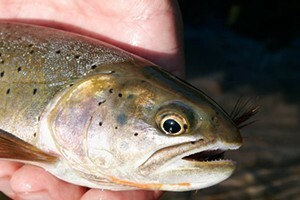 World Class fishing on over 3o miles of the Wind River Indian Reservation creeks & rivers. ORVIS Endorsed Outfitter. 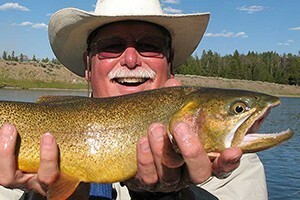 We guide the Snake, South Fork, Henrys Fork & Teton Rivers plus Yellowstone waters. After you've fished Jackson Hole, come experience the best Montana has to offer with us. Custom & daily adventures on the Yellowstone, Madison, Gallatin & Missouri Rivers. 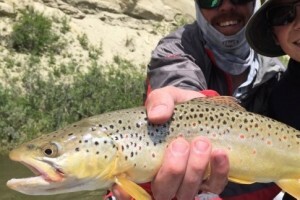 The diverse range of fishing in Wyoming is sure to please all types of anglers – with areas like the large Snake River, the high-mountain Green River Lakes, and the lesser-known North Platte River Valley providing more fishing in more beautiful places than anyone could hope to take advantage of in just one trip. Also check out Palisades Reservoir. Idaho seems to be an oft-missed corner of the West, with Montana, Wyoming and Utah drawing more visitors. Don’t let this gem of a state fly under your radar, as the fishing here is easily equal to that of its neighboring states, often with less people. Some of the best fishing locales include the Henry's Fork of the Snake, Fall River, South Fork of the Snake, and the Teton River. 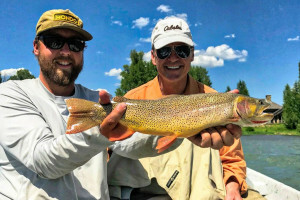 Montana is home to countless waterways famed for their fishing; Yellowstone, Clarks Fork, Gallatin, Madison, Stillwater, Boulder, and the Bighorn Rivers – all contain some of the best trout fishing in the country. Whether you go for a day or a month, a fishing trip to Montana is sure to be a success. 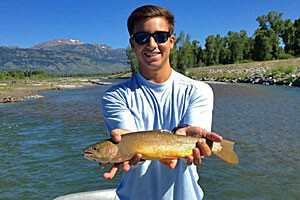 Fishing at the base of the Tetons is a must-do for any angler. Highlights include Jenny Lake, which never disappoints with some of the best scenery in the Park, and the Snake River, which offers excellent trout fishing the entire way through the park. The Jackson Lake Dam, and especially the tailwater, is a popular and reliable place to fish. Firehole, Madison, Lamar, and of course the fabulous Yellowstone River. The best ice fishing around can be found at Palisades Reservoir, just south of Jackson near Alpine. Slide Lake in the Gros Ventre Range also offers great ice fishing. Closer to home, ride your snowmobile out on Jackson Lake in Grand Teton National Park, one of the few places that allows snowmobiles within the park. Wyoming, Montana, Idaho, as well as the National Parks have different regulations and licensing systems. Stop in at your nearest fly fishing shop and ask for some advice on which type of license to buy. 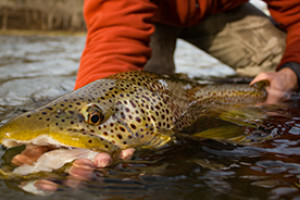 Whether you want to take advantage of one of the Jackson Hole fly fishing guide services for a day or two, find a local fishing shop to pick up some hot tips and flies, spend a weekend at one of the area’s fishing lodges or a quick and fast report on recent hatches and river flows, you’ll find the right info here.